Slice each fillet into four slices on a bias. Place in a shallow dish. Add water to cover and pour 1 cup Marukan Genuine Brewed Rice Vinegar into the water. Gently “wash” the fillets with the vinegar water. Discard water and pat salmon dry. Dip fillets into flour to coat evenly, shaking off any excess. Heat oil and butter in a skillet over medium heat. Add salmon fillets and cook until slightly browned on both sides, about two minutes per side. Remove salmon and place on platter or divide among plates. Add salt to the carrots, bell peppers, christophene, onion, habanero pepper and allspice berries. In a medium saucepan, bring the Marukan Rice Vinegar and sugar to a boil. Pour boiling vinegar over vegetables and let steep until mixture is at room temperature. Remove habanero pepper slices and discard. Drizzle extra virgin olive oil over the salmon. 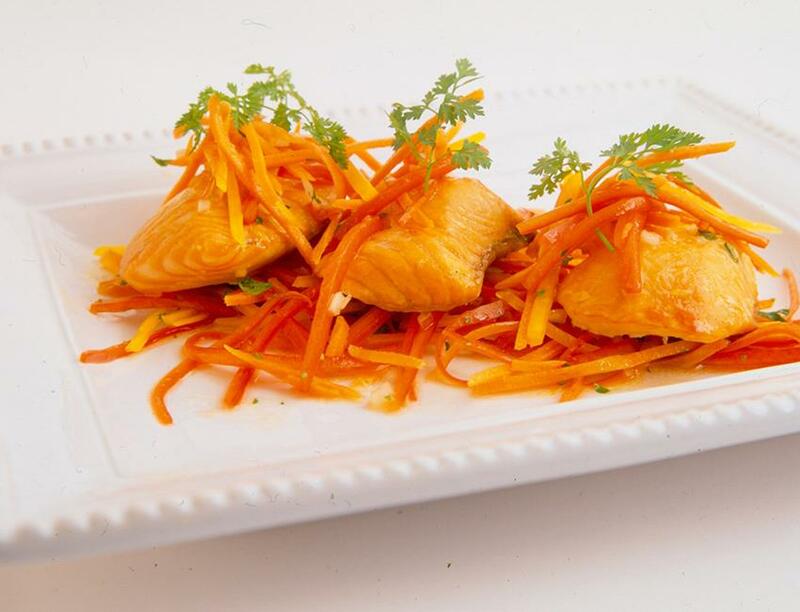 Spoon vegetables and pan juices over the salmon and garnish with micro-greens and 1 slice star fruit each.